Editor’s Note: I appreciate my wines. Red, white, rosé. Even the dessert variety, once in a while. I’m always excited to hear of new wines entering the market. The more, the merrier, right? So when I got an invite to sample a new wine label, I sent wine afficianado Smita Chakravorty to try out the new range of KSRMA wines that were launched recently. She came back with this heady report. Most Mondays for me are regular – the week ahead laden with all kinds of tasks to be ticked off my list, the weekend a much awaited but distant horizon to reach. This Monday held a few different promises! 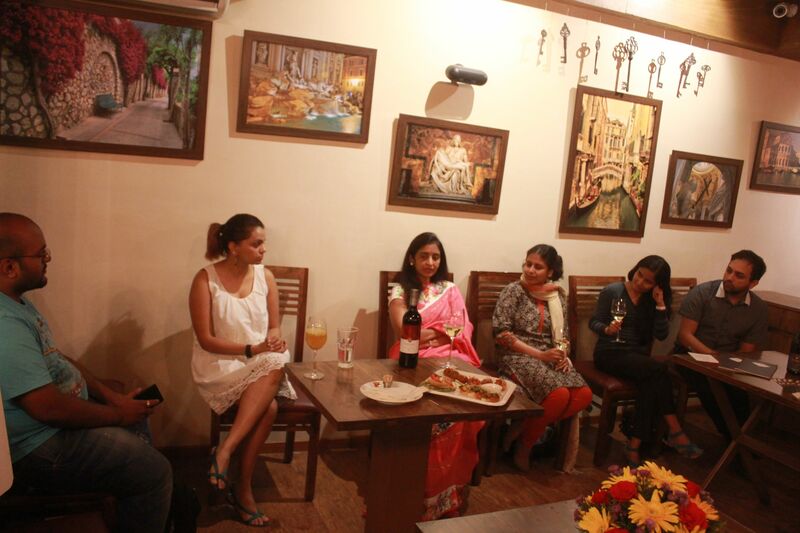 I had an invitation to a wine tasting at Chianti, a ristorante tucked away just off the 100 feet road in Indiranagar. My hosts were KRSMA estates and they were launching their new label – K2. I was greeted by my hostess, Uma Chigurapati, who seemed like another pleasant vintner until we got talking. It turned out that Uma and her husband Krishna Prasad, a dynamic couple who hold the world record for running seven half marathons in seven countries in seven days, were now turning their indomitable spirit to wine making. KRSMA wines reflects their ambitious personality – the name itself an amalgamation of the names of the co-founders Krishna and Uma. Not to be an also-ran, this brand is looking to put Indian wines on the global map. They’ve already had a running start, bagging gold medals at the San Francisco International Wine Competition and several Decanter awards, not a minor feat for a winery less than seven years old. KRSMA bottles its wines out of their vineyard in Hampi -another detour from the Nashik Valley and Bangalore. Their 2012 Cabernet Sauvignon, Sangiovese and Sauvignon Blanc are already available at a few Michelin star restaurants and retails outlets in New York – their second entry after Bangalore. We started the evening with a taste of their 2013 Chardonnay – another award-winning wine. Now usually I’m not the one for the whites – most Indian ones especially seem more acidic than the average. This chardonnay made me reconsider that verdict – fresh, with just the right amount of bite, it would be the perfect companion to a buttered fish or a creamy pasta. But while we were sipping away at our chardonnays and pecking at the delectable antipasti platter served up by Chianti, we couldn’t help but wonder when we would get to taste the star of the evening – K2. Uma told us the story behind the launch of the K2 brand. Their 2011 and 2012 Cabernet Sauvignon turned out to be the perfect bouquet of fruit and spicy oak. The grapes harvested in 2013 had a more youthful and vibrant taste – so they decided to launch it under the label K2. Uma explains that this stands both for the second edition of the KRSMA brand as well as the second highest peak in the Himalayas. K2 turned out to be quite a wonderful bouquet of flavours on the palette. It was fruity with a hint of spice, lighter than a typical red so it can easily be consumed as an aperitif or paired with proteins like chicken/lamb. Like all its other counterparts, K2 is also estate bottled and comes with a vibrant marsala label reflecting its colourful taste. The conversation sparkled and the evening passed smoothly as we sipped on our goblets of K2 and discussed the story of the vivacious entrepreneurs behind the nascent but ambitious KRSMA estate wines. As we headed back to our homes, the heady evening aroma and spice of K2 still lingered on our palettes and in our memories. Speaking for myself, I cannot wait to head to the nearest store and pick up a bottle of K2 and relieve those memories, this time with new friends in new places. Photo courtesy: Nivedith G and KRSMA Estates. Next PostWhy TRI: 9 fun reasons you should give multi-sport a spin!